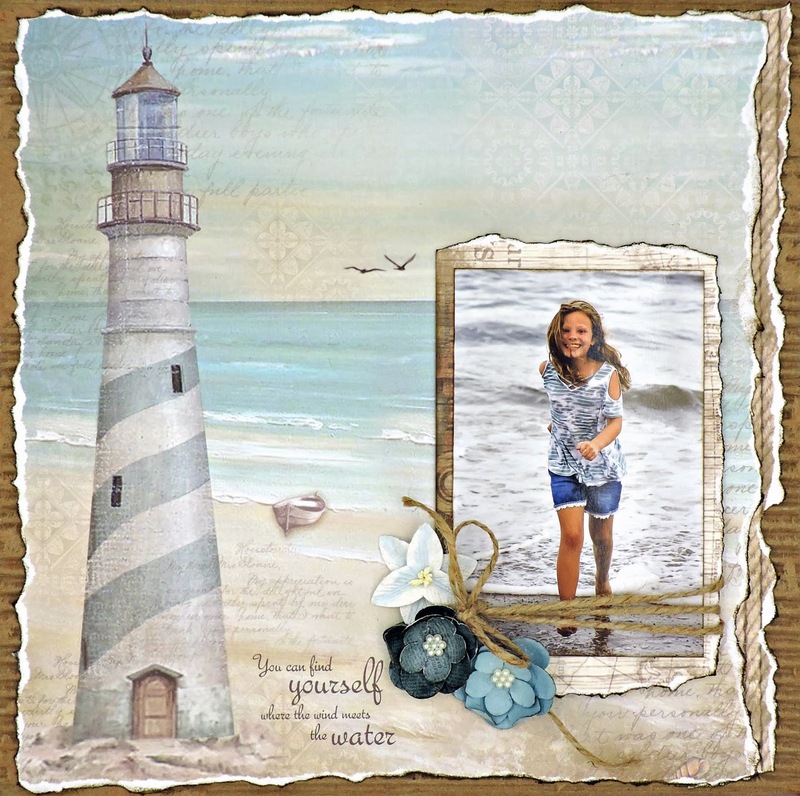 This photo, taken by my daughter-in-law, went to the top of my “Must Scrap” pile the instant I saw it The Sea Land collection from Stamperia gave me the perfect setting for this layout. The paper is so richly detailed that I thought I should keep the page simple. I cut a 12” x 12” square from a piece of packaging and removed the paper from the front to expose the corrugated ribs. Next, I tore the pattern paper around all four sides and inked the edges. To create interest, I took another sheet and cut a narrow strip to tuck underneath the right side of my layout. Before gluing it all down, I tore and inked the exposed side. Still keeping it simple, I selected a section from the reverse side of the paper that I used for the strip. This was torn on three sides and inked. I adhered a bit of chipboard to the back of the photo and then to the matting. Before gluing it down, I wrapped the bottom of the photo several times with jute and created a bow. I added more chipboard to the back so everything would lie flat and glued it down. About the title: The sentiment on the paper captured the photo so well that I decided to use the last part. I usually struggle with titles, but this one is perfect!